It’s never fun to lose a phone. It’s even less fun to lose a phone that has all your personal information and important work data on it, however, which is what happens when you lose a smart phone like a BlackBerry. Many a businessman has been kept awake at night by the thought of misplacing, or, even worse, having his BlackBerry get stolen. But BlackBerry owners can sleep well knowing that their phones will be safe, as Research in Motion (RIM) has announced a new security application called BlackBerry Protect. BlackBerry Protect is the first free in-house service that provides BlackBerry owners with all the tools they need to protect their phone should it go missing. The first of these tools is the ability to automatically back up data. 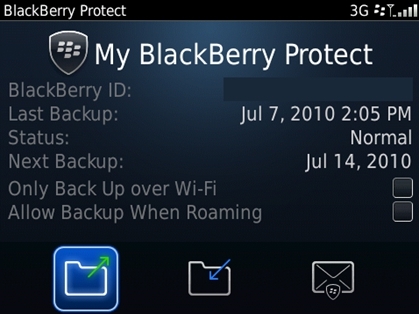 When you download and install the BlackBerry Protect application, you will be given the option to backup the data on your BlackBerry. If you choose to backup your data, you will be able to decide what data you want backed up and how often (daily, weekly, or monthly). The best part, however, is that only new data will be backed up after the first backup is completed, instead of just backing up the same old data over and over again and increasing data usage. 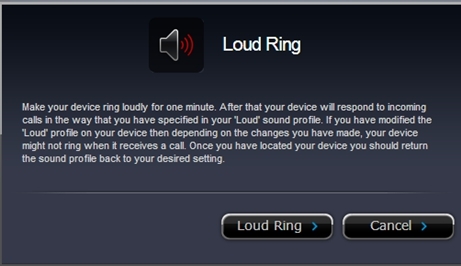 Another helpful feature and my personal favorite is Loud Ring. Basically, if you misplace your BlackBerry in your apartment, say, under a pile of dirty laundry, you can log into the BlackBerry Protect web portal and activate the loud ring feature, which makes your phone ring loudly for one minute (even if it was set on silent!). Additionally, this feature will change the default profile to loud, so if you still can’t find your phone after the ringing stops you can call it on another phone and keep searching for it. I can’t even begin to describe how incredibly handy this feature would be for a person like me, considering how many times I’ve turned my room inside out trying to find my phone after “misplacing” it. BlackBerry Protect also has a slew of features intended to handle every businessman’s worst nightmare: the dreaded loss of the BlackBerry. First up is the ability to remotely lock your phone and set up a password if you leave your BlackBerry somewhere or it gets stolen. Next, you can set up a “lost and found” screen with a polite message listing your contact information and saying “If you find this device, call me at “000-000-0000,” so a good Samaritan who finds the phone can get in touch with you to return it. If you have doubts in your fellow man, you can go into the web portal and use the “view current location” feature to see where your missing phone is via the phone’s built-in GPS system. Finally, if you are unable to find your phone and no one has called, you can delete all the information off the phone using the Remote Wipe feature. This will include all data stored on the phone as well as on the Micro-SD card. But while this may feel like the end of the world for some of you out there, it really isn’t, because the last feature on BlackBerry Protect is the ability to wirelessly restore all backed up data from your old BlackBerry onto a new device. Some smart phone aficionados may be thinking that this sounds a little familiar right now. This is because this is not the first time a company has created a service like this to protect its smart phones. Apple has a strikingly similar service called MobileMe, which has the exact same safety features as BlackBerry Protect when it comes to locating, protecting, and wiping lost or stolen phones. So what does BlackBerry Protect have to offer that MobileMe doesn’t? Well, MobileMe costs a grand total of $99 per year for an individual subscription after a 60-day free trial, and $149 per year for a family pack. BlackBerry Protect, on the other hand, is free. I know it may hurt to admit it, Apple fans, but RIM really did outdo Apple on this one. Unfortunately, BlackBerry Protect is not available to the general public yet and is currently only being launched as a beta via invite codes through BlackBerry Beta Zone. RIM has assured customers, however, that there will an open public beta available later this year. Overall, I think that this is a brilliant move on RIM’s part. Any successful company knows that the name of the game at the end of the day is customer satisfaction, and I for one can’t see any reason why BlackBerry users won’t be satisfied knowing that their BlackBerry is soon to be one of the most thoroughly protected smart phones out there and at no cost to them.